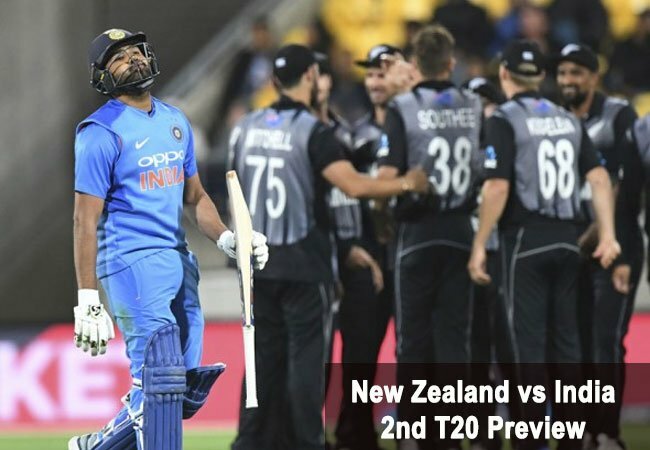 New Zealand vs India 2nd T20 Preview: After succumbing to a record 80-run loss in the first Twenty20 International, India will be desperate to settle terms in the second of three T20Is in Auckland on Friday, 8 February. What to expect: In the three Super Smash games played at Eden Park this season, 180-plus totals have been achieved four times – hinting at another high-scorer when New Zealand and India face off. Partly cloudy condition with a high of 21 degree Celsius are forecast during the match time. New Zealand: Not opting for both James Neesham and Doug Bracewell for the first game, New Zealand went in with Daryl Mitchell and Colin de Grandhomme as the all-round choices. However, both failed to make any substantial contribution with the bat which might force the management to look at Neesham and Bracewell for the second game. India: The visitors had six bowling options in the first T20I but they used only five, not opting for Vijay Shankar with the ball. The Tamil Nadu all-rounder, however, came up with a promising knock with the bat and could be persisted with for the second match. Meanwhile, both Dinesh Karthik and Rishabh Pant failed with the bat, Hardik Pandya was a let-down with both bat and ball, while Khaleel Ahmed and Bhuvnenshwar Kumar had expensive figures. Should they look at reinforcements, India have plenty of replacement options in Mohammed Siraj, Shubman Gill, Siddarth Kaul, Kedar Jadhav and Kuldeep Yadav, who all warmed the bench during the first game. – New Zealand are the only team against whom India have more losses than wins in T20Is. They have won only two of the nine matches played against the Blackcaps. – The last time India lost a T20I series (min. two matches) was against the Windies in Florida in August 2016. – Rohit Sharma needs one more fifty-plus score to go past Virat Kohli as the player with most fifty-plus scores in T20Is. Both are tied with 19 such scores. – Rohit Sharma needs two more sixes to reach the milestone of 100 sixes in T20Is. Chris Gayle and Martin Guptill currently top this list with 103 sixes apiece. “The White Ferns game was a fantastic one, it ebbed and flowed all through. We have copied each other through the series and hopefully they can beat them in the next game and we’ll carry it forward” – Kane Williamson is hoping for another double success for New Zealand.